eBay just announced that it has acquired RedLaser, a nifty barcode-scanning application for iPhone, and related technology from Occipital. Terms for the deal were not disclosed. 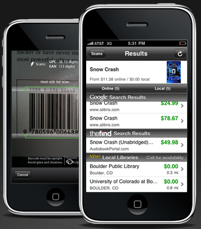 The app has seen over two million downloads from the App Store and is one of the most popular barcode-scanning applications for comparison shopping. RedLaser’s barcode-scanning application, which looks up price comparisons in its product database, was created specifically to deal with non-autofocus cameras (i.e. mobile phones) and has licensed its technology to over 70 companies (though it’s unclear what the future of these agreements will be with the acquisition). Unsurprisingly, eBay says that it plans to integrate RedLaser’s barcode-scanning technology into its iPhone applications, including its eBay Marketplace, eBay Selling, StubHub and Shopping.com applications. eBay has also made RedLaser a free app (it was originally $1.99) and will be integrating more than 200 million listings from eBay, as well as product inventory from over 7,000 merchants on Shopping.com. This is a huge win for startup Occipital, a TechStars incubated company that launched in 2008. Occipital will continue to develop Snapture and and FoodScanner. The acquisition isn’t surprising considering eBay’s big push into mobile e-commerce. eBay is on pace to reach a whopping $1.5 billion worth of goods sold via mobile phones in 2010. eBay has a number of iPhone apps available and the company launched iPad and Android apps this year.